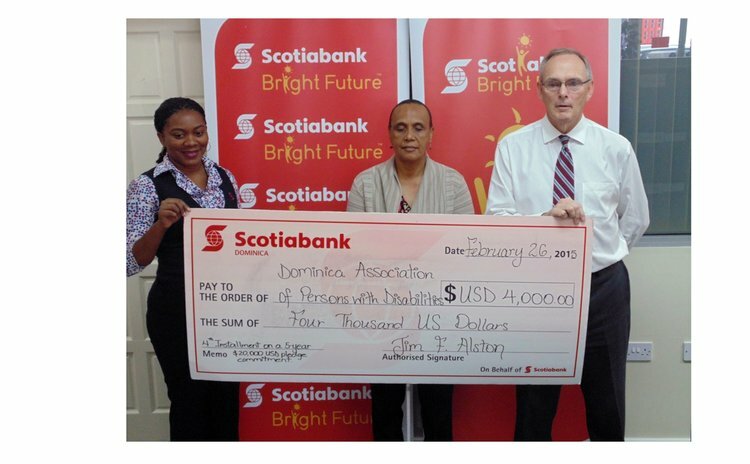 Dominica, February 26, 2015– The continuing push to integrate and empower Dominica's disabled community got a helping hand recently when Scotiabank contributed USD$4000 to the Dominica Association of Persons with Disabilities (DAPD). The contribution from the Bank's global philanthropic program Bright Future, is part of Scotiabank's ongoing five-year pledge of assistance to the DAPD. Under the partnership which was first started in 2011, the Bank has supported the DAPD's outreach and training activities, including visual awareness training, the DAPD's week of activities and the observance of the International Day of Persons with Disabilities. Scotiabank country manager Jim Alston said that supporting the community was an integral part of Scotiabank's culture. "It's important to us as a company that we give back to the community. It's even more satisfying when we can do it on a long-term basis as we have done with the DAPD as it allows them to plan and organise their programmes in a more sustainable way," he stated.